2 users thanked ask for this useful post. Thank you for the new Version the PTZ zoome is what i Need since a Longe time! I have a question with the ptz shurtcuts, i will use the zoome in out and move left right funktion with the numpad the problem is if i set zoom in on + its zoom in to 100%. for each klick on + its zoome in a litle bit more. The same for the other funktion move left right up and down. Though it's possible it's obviously not ideal or recommended. How are x and y coordinates going to be calculated in GT? * Fixed Auto column mapping issue in Data Sources with GT files. * Fixed GT Layer numbering when creating Group Layer. * Fixed GT saving issue in regions with "," decimal point. * Fixed GT TransitionOut stuck issue in some cases on 59.94p/60p productions. * Added Logitech Rally PTZ support for 4K via MF capture. 12 users thanked admin for this useful post. There's still something amiss with accessing the Rally camera. Video format not supported by device"
It would seem that there is some difference between Brio and Rally. Brio works with NV12 at all resolutions, including 4k. Rally seems to require MJPEG to reach 4K. When I attempted to re-position the title using the Pan Y control (from the Position tab in the title Input), the title became crushed. When I re-positioned the title by drag-and-drop, it moved okay. It was probably just me. error.JPG (55kb) downloaded 2 time(s). - As soon as Ive got multiple items placed in a vertical plane (leaderboards) I have trouble aligning them with Snap Align on. When dragging any item it will constantly snap to different places and make it impossible to move. - When editing multiple item animations, as soon as you change any of the timings or animation smoothness, it will overwrite individual timings of all those parameters to all selected items, rather than just the edited one. For example, I have a bunch of bars above each other with staggered animation starts. When I edit the duration, it will set the delay and smoothening to the displayed items parameters to all selected bars. This does not happen if I change the animation type tho. - When selecting font, I can not mouse scroll wheel through the list after opening the dropdown (think its the same for the other dropdowns. Scrolling does work with a closed list selected. Is this beta safe to install alongside vmix 21? I'd like to test it, but I don't want to lose vmix21 functionality for actual production. I think there is a problem with Title Editor window staying on top of everything when giving focus to another software's window. I guess it should go in the background (like vMix UI) not to occult the other app. This appears to be a bug, the presets should be showing in the right click menu. 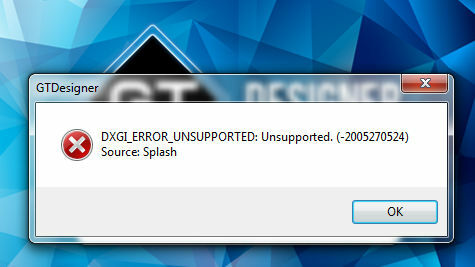 Trying to run the GT on my laptop but getting this error message. No, they are not backwards compatible. It is only for vMix 22 and onwards. 1 user thanked stigaard for this useful post.